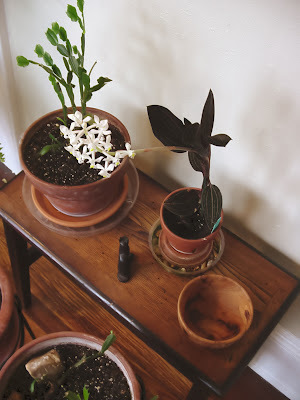 Walhydra's Porch: Is it Spring yet? Having hidden under the covers since mid-October, Walhydra has been wondering how to go about poking her head out again, crocus-like. Some of her readers may recognize the sense of awkwardness which can accompany recovery from depression. After months of moaning to friends and avoiding strangers, now Walhydra has to go about telling folks how much better she is feeling. Not the sort of thing a melancholic person usually enjoys—unless, perhaps, it includes modestly accepting congratulations for having made such wise medical choices. What's more, in difficult moments, Walhydra catches herself indulging nostalgia for the perverse comfort of hiding beneath her own seeming despair and helplessness. Fortunately, this latest round of depression has been far too viscerally unpleasant, and Walhydra's real-world responsibilities, far too important. After the annoying detour in December, she is glad to report that the SSRI experiment is now working well. Whenever she realizes that the nostalgia is tempting her, she quickly tells herself: "It's the chemistry, stupid." Of course, now that her chemical balance is being artificially maintained, Walhydra knows she needs to be an adult again. She needs to face and deal responsibly with a maze of family, medical, financial and legal matters of far more consequence to others than any mazes she's lost herself in before. That's part of the "becoming mortal" business she acknowledged before Yule. Walhydra has no children of her own (at least in this lifetime). She hasn't until now been responsible for assuring the wellbeing of loved ones…except, of course, for playing fair as an equal adult partner in the blessèd relationship with hubby Jim. However fraught with risk her previous descents into the underworld might have seemed, it was Walhydra who would be most directly hurt by inaction or ineffective action. Now there's her mother, Senior Witch, her sister and brother, her father, the retired Lutheran pastor, and his second wife, the two step-sisters and their three children…etc., etc., etc. It's no mystery why Walhydra crawled under the covers of depression back last Spring. Obviously, though, Walhydra's prolonged crisis hasn't really been just about brain chemistry. In fact, because of the "annoying detour," her best Virgo efforts to engineer a recovery of psychic orderliness before Senior Witch's Christmas visit backfired. Instead, Walhydra was in the midst of side effects-induced panic attacks for the first three days of that visit. Life's real presence yanked the covers off and said, "deal with it!" Walhydra's real crisis, in other words, has been a crisis of faith. Not, the gentle reader should understand, a crisis of losing faith. A crisis, rather, of using faith when nothing else was available. "It's all well and good," Walhydra grumbles, "to say, 'It's the chemistry, stupid.' But when every little challenge, real or imagined, seems enormously ominous, you still have to act—or at least to keep yourself from fleeing in panic." Now, Walhydra is always wary of talking about faith in public. She is very firm in her private faith—even when she doesn't practice it very well. However, the public faith words are all taken, and they carry too much controversial, contradictory baggage. Walhydra's friend Cat put it very well recently, when she described Cuban American Quaker minister Benigno Sanchez-Eppler's concept of religious code-switching. [Beningo has spoken] on what's it's like to have a rich, active spiritual life with roots in (literally) two languages, since his spiritual development occurred in Spanish in his youth and in English in his adulthood. Some of the language with which he has mapped his spiritual experiences does not translate well from one tongue to the next, and, to truly communicate his deepest experiences, he finds he must have access to both languages at once—something linguists apparently term code switching. The point Benigno made over and over again was that "code switchers are not confused." traditions are not playing pick-and-choose, designer-style spirituality.... Rather, we are code-switching—using the metaphorical language best suited to reflecting the lived spiritual experience we are trying to convey. I am not saying that God or the gods or Spirit is a metaphor.... Instead, I'm saying...that, because we humans don't understand the gods..., we only ever understand them through metaphors—imprecise, inadequate, but powerful echoes of a reality we can only dimly touch. Some of us have heard the voice of Spirit speaking in many different metaphorical/ mythological "languages." We have become bilingual through experience. We are code-switchers, and it can be hard for us to communicate in ways that others will hear and respect. "So," Walhydra says, staring her audience down. "I'm a code-switcher, and I am not confused. See if you can keep up with me." Privately, Walhydra tends to use the "code" of her native religion, Christianity. For decades she has quested on Pagan, Buddhist and other paths, having discovered in seminary that the outward forms and doctrines of orthodox Christianity didn't really compute for her. When I came out in 1973, I realized that I had to make a choice between striving to meet the expectations of "acceptable" Christianity, on the one hand, or embracing and living what Mother-Father God created me to be, on the other. If one hears YHWH say "Forget the safety of cultural and religious orthodoxy and live with me"—and if one accepts that daunting challenge—fear, awe and joy become ongoing vibrations in one's life. It's difficult ever after to really explain to anyone else what it is that one trusts so implicitly...or why. In the past few years, though, Walhydra has been looking for the pre-theological core of her faith, her spiritual enthusiasm [from Greek enthous, entheos, possessed, inspired : en-, in + theos, god]. Guess what? She found its roots in the positive visceral childhood experiences of Lutheran Sunday School, her father's sermons, her mother's organ-playing, and the hymn-singing of the congregation's old ladies. This actually makes sense, though. Ever since childhood, the real Jesus—who is far more real than any of the "Christianities" seem able to express—has been Walhydra's hero. Walhydra imbibed all of those Sunday School stories and sermons and hymns, to the point that Jesus became a real presence for her, a divine human of fierce integrity and fierce compassion. Whenever anyone makes false claims in his name, he lets her know. More to the point, whenever Walhydra causes harm or tries to hide, he lets her know. So...back to the winter faith crisis, which stretched from Samhain through Yule and beyond. While the SSRIs were swirling around, tripping homeostatic switches back and forth, Walhydra was trying to do her job (pretending to be nice to library customers). At the same time, she was trying to psyche herself for the visit from Senior Witch—plus her brother, sister-in-law and Bard sophomore nephew, a beautiful, brilliant trio from the sacred land of Massachusetts. How did using faith work through all of this? Every morning when she awoke, every moment throughout the day when swirling neurochemicals threatened to pull her under, Walhydra would stop herself with a deep breath. "I'm just in the present," she would whisper, and try to center down into the divine Presence. If that wasn't enough, she would reach for whatever outer world spiritual geegaws might help her remember that she is okay. That she is loved by the Divine One, even when all she can do is sit there in chemical panic. If she was fortunate enough to be with hubby Jim, that blessèd man would spontaneously whisper "I love you" and give her his warm Leo hug—without asking for explanations or striving to "fix things." A month later, Walhydra is sailing into the new year, starting new projects at work, and mentoring a bright new library associate on her staff. A week before Imbolc, just when Walhydra was itching to plunge back into the blogosphere, another of her online friends gave her the marvelous gift of sharing the dream she had had about Walhydra the night before. Somehow this wonderful soul had glimpsed the shimmering, gorgeous colors beneath Walhydra's drab black uniform. "Drat!" Walhydra thought, secretly delighted. "My secret is out." So, here we are. A new moon. A new year. Having survived the ”Super Fat Tuesday Bowl" and blessing ourselves with the ashes of the One who holds us all. When Walhydra finally lifted her covers, she noticed something nice. 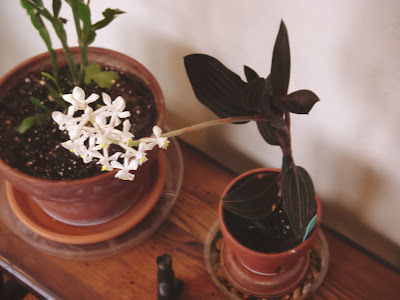 A year ago in March, she had bought "on faith" an orchid plant which she was told would have a cluster of small white blossoms if it bloomed. Oh, blessed be, Wallhydra. :) And joyous Imbolc--it is indeed spring--even here in Massachusetts, where (I am not making this up!) I heard birds singing in the giant, scraggly tree down the street today. And the tree had red buds at the tips of all its branches. Speaking of faith to getting you through, you say would repeat, "I'm just in the present," and try to center down into the divine Presence." And, of course, chemistry is good and useful, and not to be scorned when it is useful. But those connections to the Light are vital, too. It isn't just chemistry that's making the buds on the tree down the street from me redden and swell. I don't know how trees sense God, but I'm pretty sure they do. And blessed, blessed be, say I. As usual, you have lifted me up with your words. Thank you for the description of code-switching; that makes sense to me, and causes me to look far more kindly on my own cafeteria-style of spirituality.